We require a $50 minimum order amount to ship Orders to Alaska, Hawaii, Puerto Rico, Virgin Islands, Guam. We can ship to APO/FPO addresses via United States Postal Services. Please select Ground Shipping for Parcel Post, delivery time can take up to 4 weeks. For faster service, please select 3DAY AIR and delivery time can take up to 2 weeks. Following submission of each order, an email confirmation of the order is sent. Orders received by 1:00 pm (est) usually process the same business day. Orders are usually shipped within 1 business day after it is received, if the credit card provided validates and the merchandise is in stock. Personalized Banners ship within 48 hours and special custom orders will ship separately. *All free freight promotions are UPS ground to contiguous 48 states only. 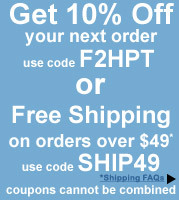 Valid coupon code must be entered at checkout to receive Free Shipping. Minimum merchandise total to qualify for the offer does not include shipping, handling, or taxes. Offer may not be not combined with other coupon codes. Not valid for prior purchases. Discounted shipping is good on Ground shipping. Shipping will be reflected on the order checkout page in the selection box.